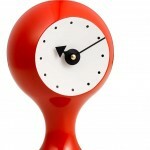 The Vitra Ball clock belongs, indisputably, to the most humorous of George Nelson's sculptural clocks he created in the years 1948-1960. 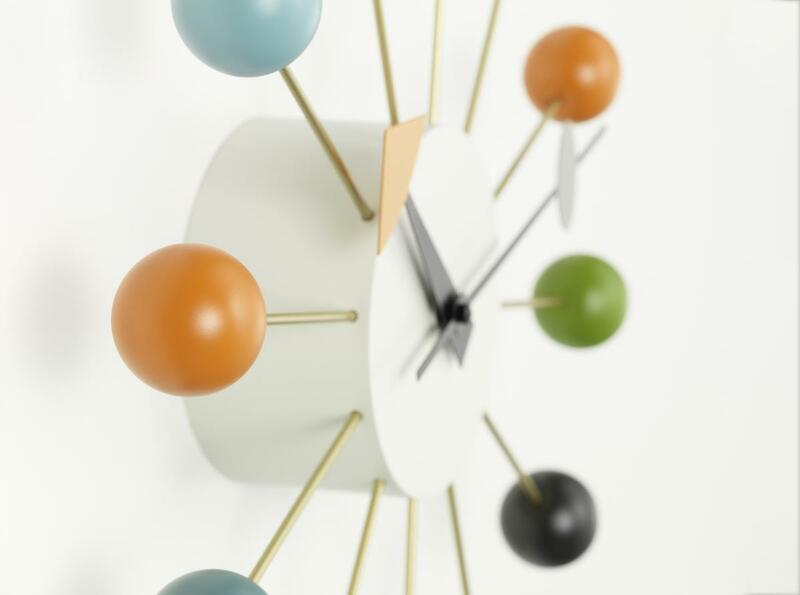 Presenting brightly coloured balls either monotone or multi-coloured attached to a reduced metal frame the Nelson Ball Clock is an endearing sculptural reference to the beauty of basic geometric shapes. 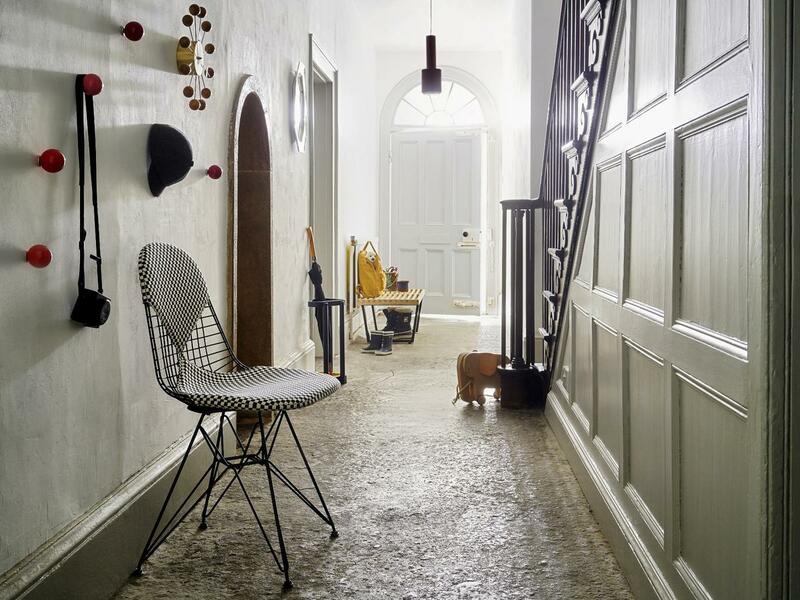 Care The surface can be wiped with a soft, damp cloth. 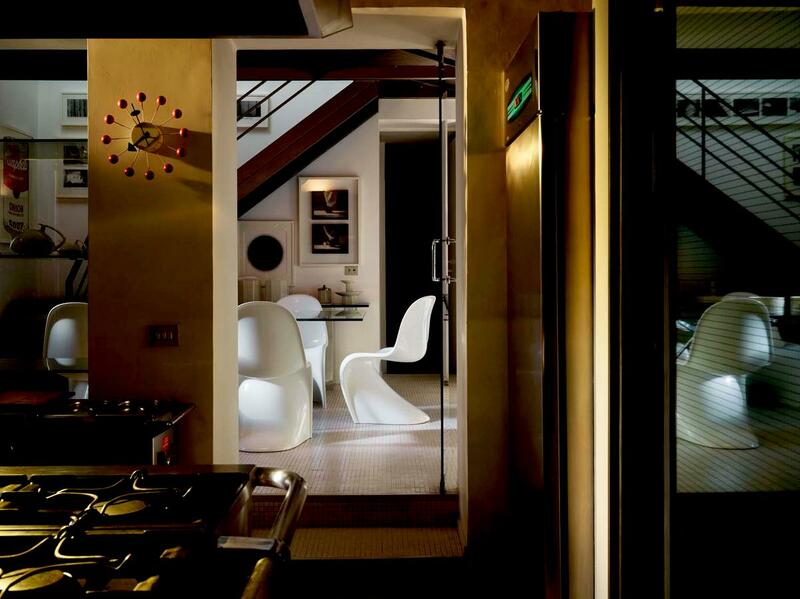 If necessary, use lukewarm water with a small amount of mild neutral detergent. The Vitra Ball Clock is a design classic which is not just fun, but also works. Featuring painted wooden balls reminiscent of more innocent childhood days in place of numbers, the Vitra wall clock is one of a series of wall clocks created by the designer George Nelson for the Howard Miller Clock Company between 1948-1960. This horologists was a subsidiary of the famous Hermann Miller Furniture Company, or better put, a son: Howard Miller, son of the famous furniture manufacturer Herman Miller utilised in the company the full depth of knowledge he had acquired from his time with a traditional clock maker in the Black Forest. 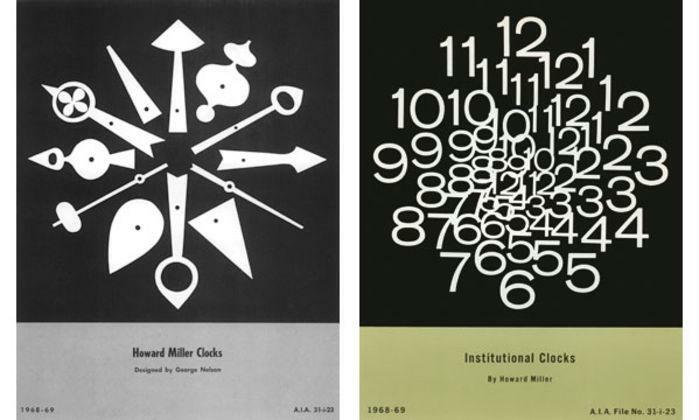 George Nelson,creative director of Herman Miller since 1945 complimented the technical experience with appealing designs. 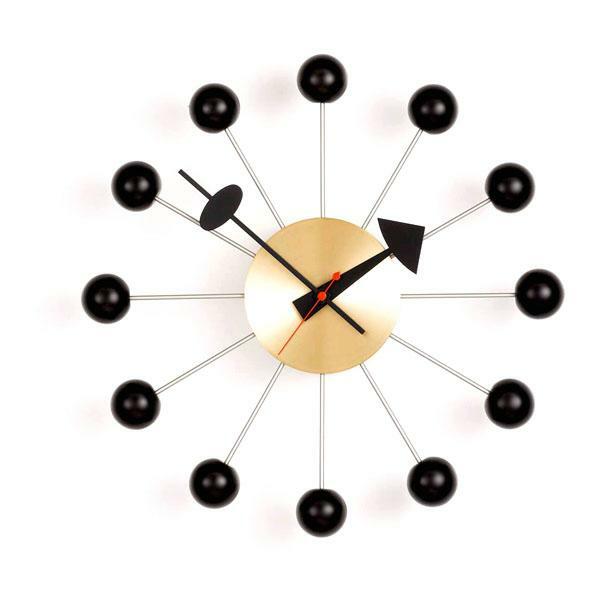 Vitra have produced the Ball Clock and other George Nelson clocks since the 1990s. 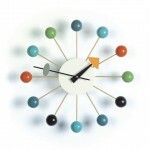 The colourful Ball Clock is typical of the American design culture of the 1950s. 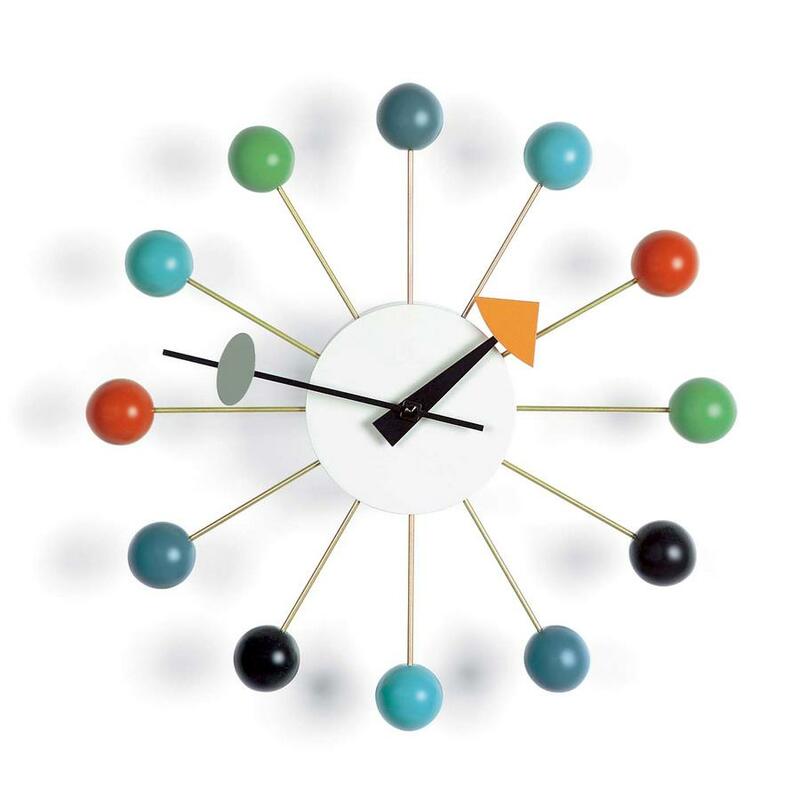 The defining aspect of the Vitra Ball Clock: The interplay of twelve rustic wooden balls and small metal braces that shoot from the middle body. 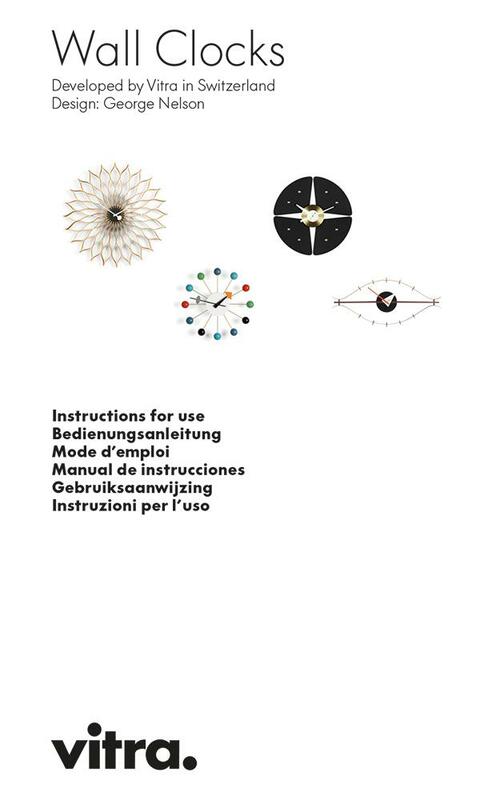 Depending on the version selected the wooden balls are either left natural or painted black or multicoloured, the strut and the body, which also houses the high-quality quartz movement, are made of metal. In the noble variant of the George Nelson clock with black painted wooden balls is the corpus is brass. 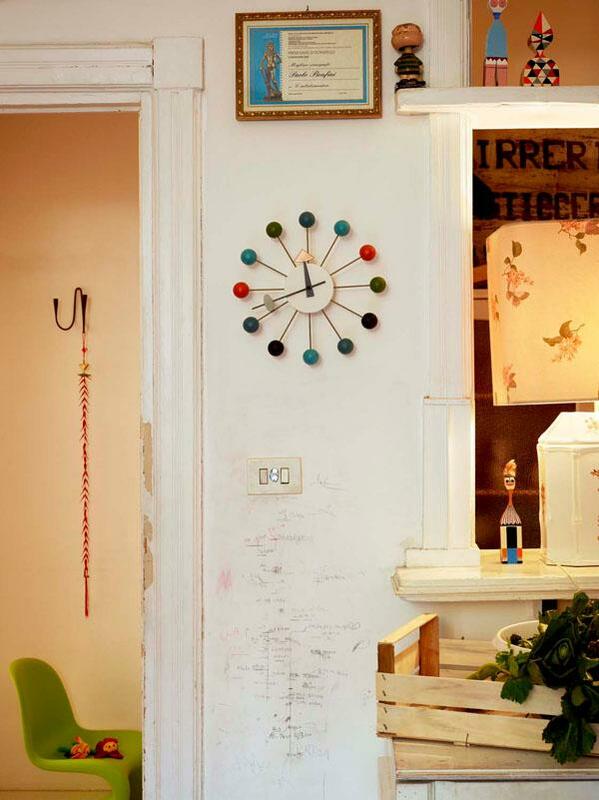 The colourful versions of the Vitra Ball Clock radiate a charming a touch of naivety which contradicts the exactness with which one usually associates a clock: thus making checking the time a moment of pleasure. 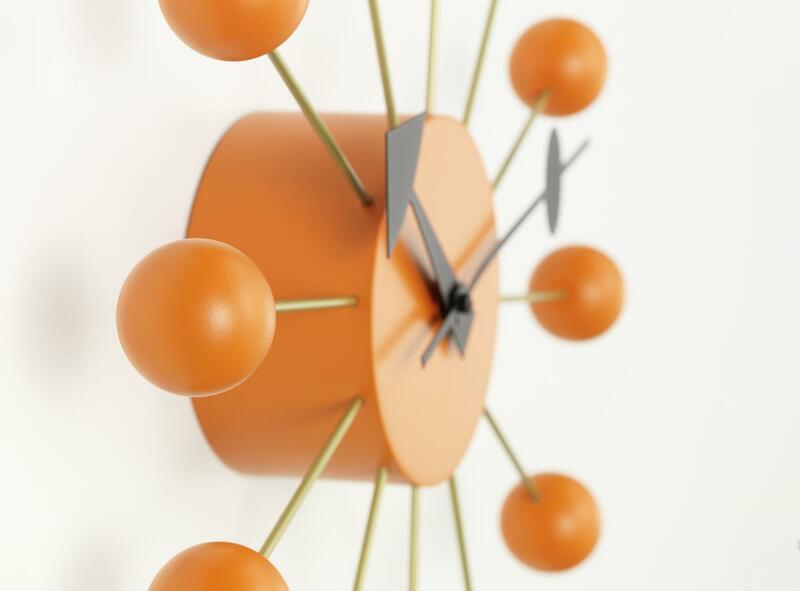 Like the other Vitra Wall Clocks the Ball Clock is largely manufactured by hand and in accordance with the Swiss manufacturer's principles of sustainability. In 1950s America the development of the consumer society was well developed: commodities were no longer considered solely according to functional criteria - aesthetics were become an important part of the purchase decision. 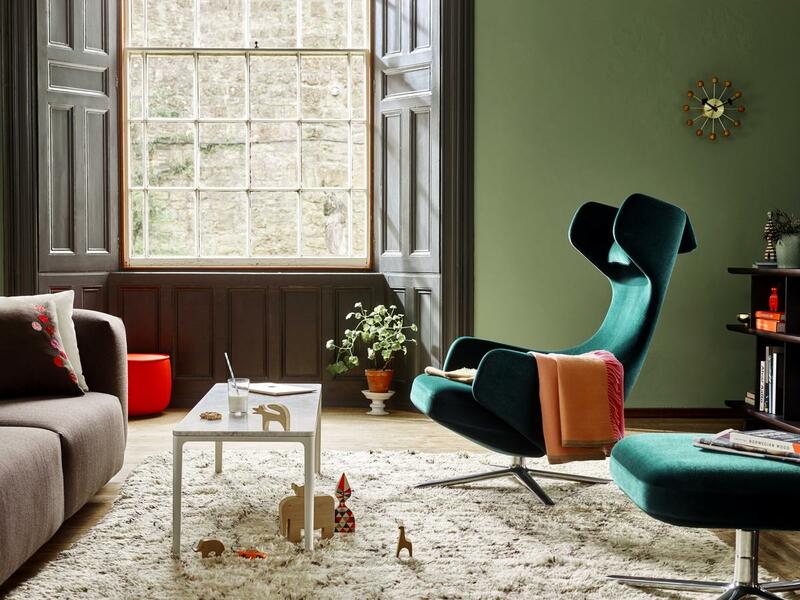 The economic boom thus allowed for the dissemination of design into American households, whether in the form of furniture, utensils and accessories. 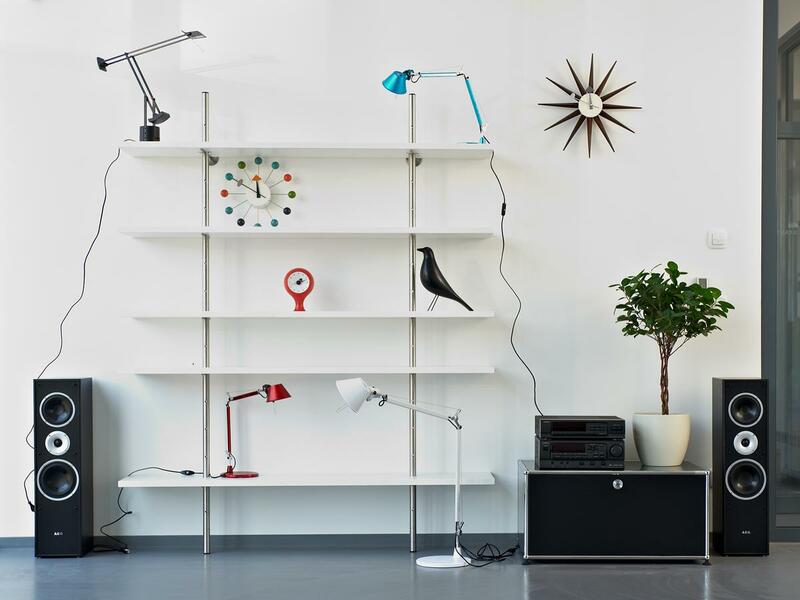 And perhaps the most notable proponent of this mood for aesthetically functional objects was George Nelson and his designs of everyday objects such as lamps, clocks and other home accessories. 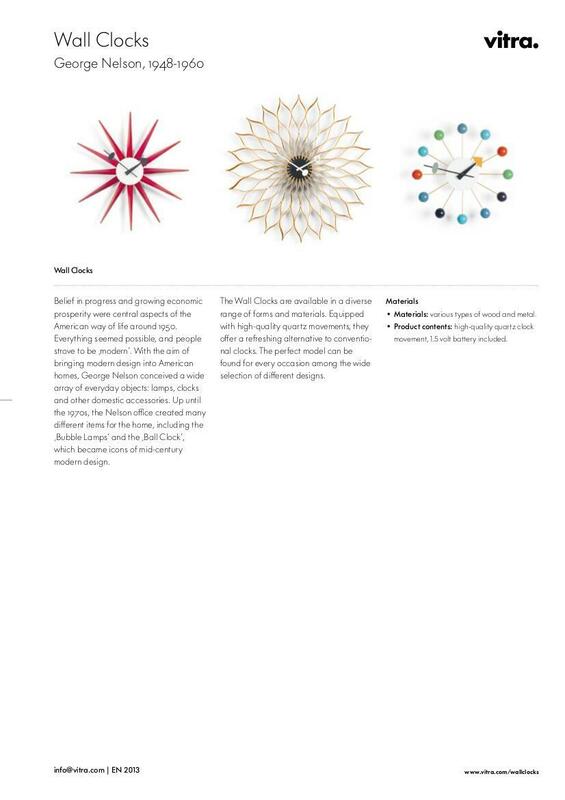 The wall clock collection, which in addition to the Vitra Ball Clock also includes the famous Sunflower Clock are perfect examples of an popular desire for design that makes consumer goods more than is expected of them. 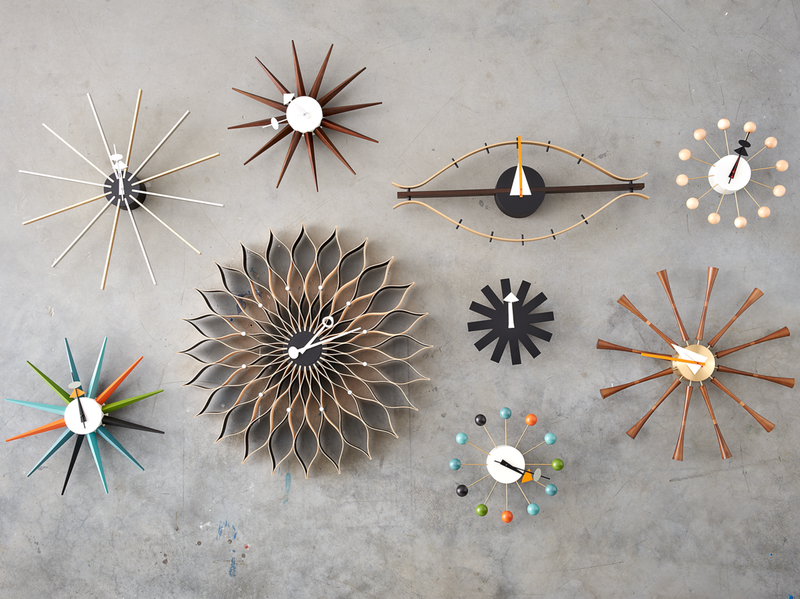 In 2013 Vitra extended the the George Nelson wall clock family with the launch of a new black version. 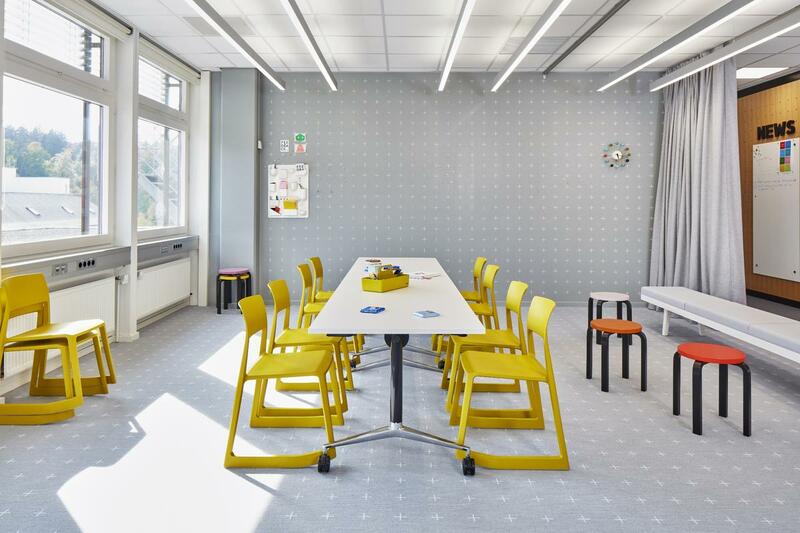 After the Miller Clock Company ceased production of the Nelson wall clocks, Vitra resumed production in the 1990s - and so enriched the Vitra Nelson Collection. 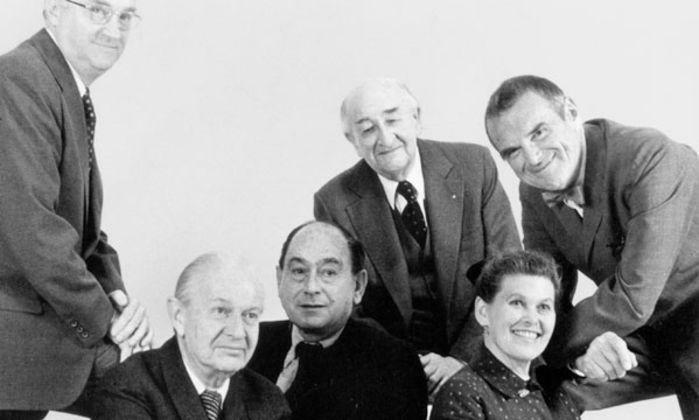 Vitra are largely responsible for the dissemination, and so popularity, of many American Mid-Century Designs throughout Europe; in addition to works by the likes of George Nelson or Alexander Girard, Vitra are also the exclusive licensed producers of products by Ray & Charles Eames in Europe. 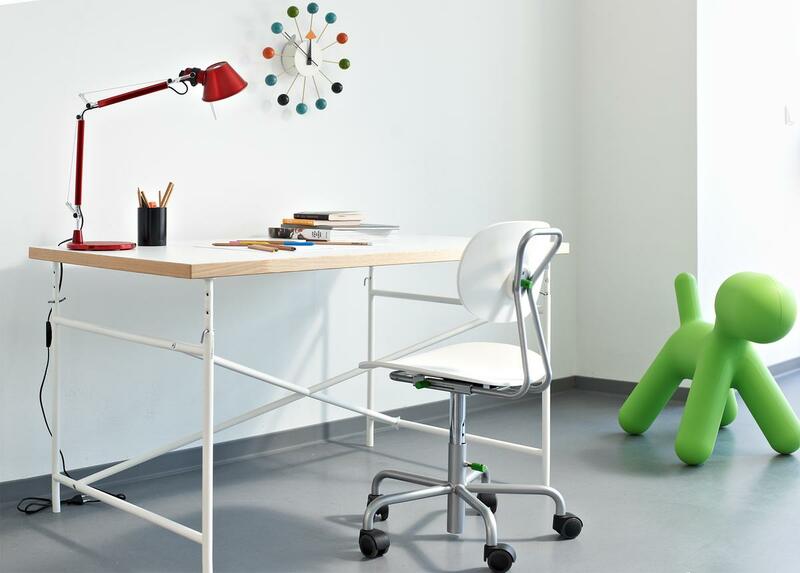 However Vitra pursue the principle of giving everyday objects a value which brings an added value to everyday life not only through design classics: the furniture manufacturer is also actively involved in the creation of new, high-quality design, in cooperation with contemporary design talents like Jasper Morrison or Hella Jongerius. 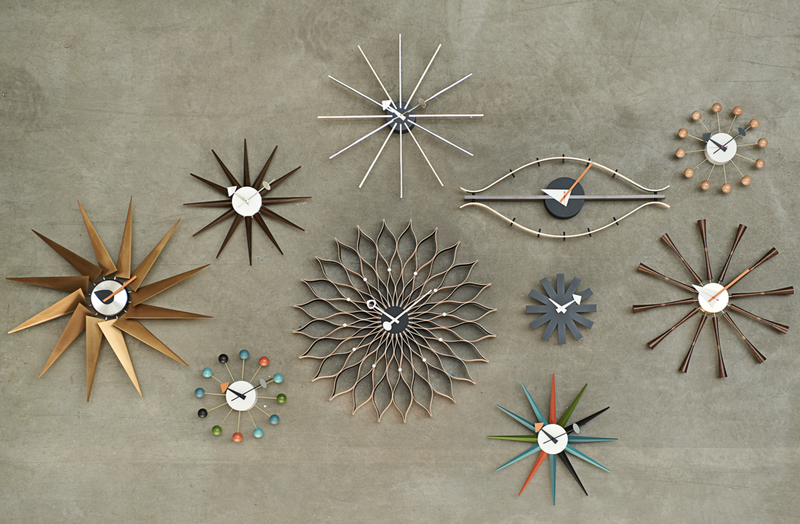 Vitra has produced the George Nelson wall clocks since the 1990s.